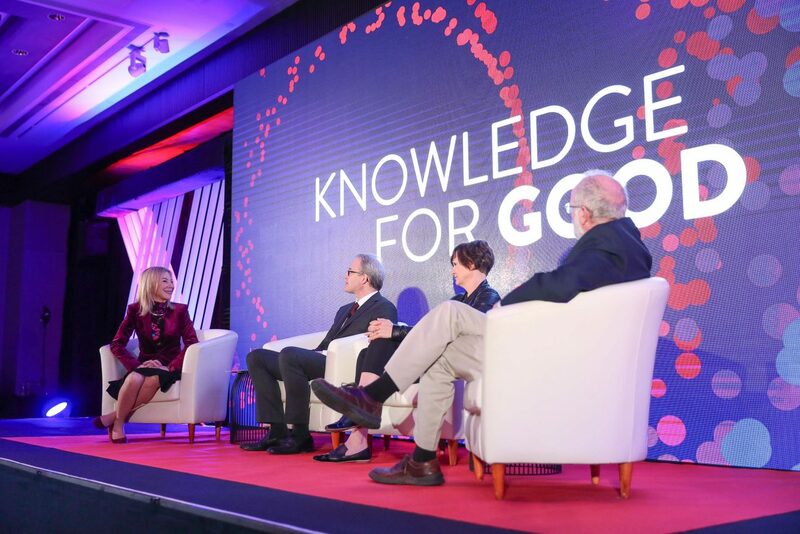 President Amy Gutmann emphasized the three pillars of her vision for the future of Penn—innovation, inclusion, and impact—while speaking at The Power of Penn Celebration in Hong Kong on March 6. With over 5,000 international students and over 1,000 faculty conducting research, teaching, and leading projects across all seven continents, Penn is more global than ever before. Within this landscape, Penn’s relationship with China stands out. China is the single largest country represented in the University’s student body after the United States, and Penn’s Chinese alumni network is one of the strongest in the world. 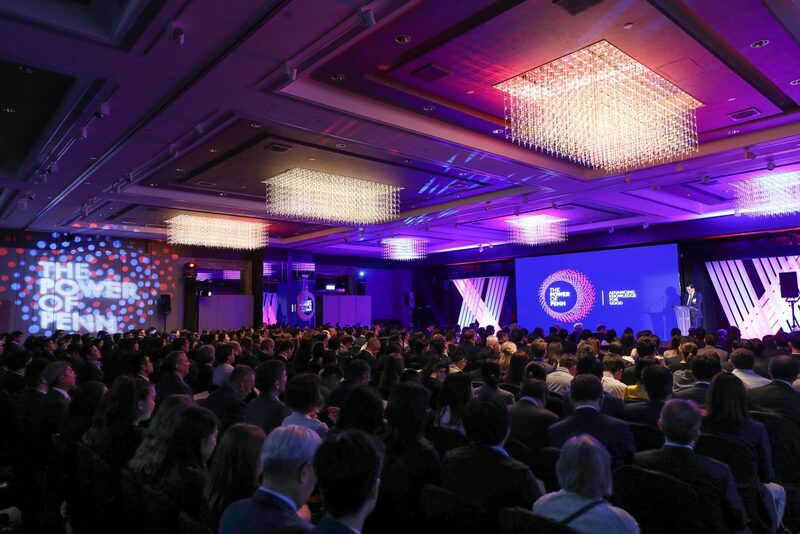 The strength of these connections was represented on March 6 by the robust turnout of more than 400 parents, alumni, and friends at The Power of Penn Celebration in Hong Kong. At the event, Penn Trustee George Hongchoy, WG’91, PAR’18, PAR’21, welcomed guests and spoke about the impact of sharing knowledge across cultures—a theme reiterated throughout the evening in President Amy Gutmann’s remarks, and in the conversation that she led with three Penn faculty members. Mr. Hongchoy acknowledged fellow Trustees and leadership volunteers in the audience. He also recognized Penn academic leaders in attendance—Fritz Steiner, Paley Professor and Dean of the newly renamed Penn Weitzman School of Design; Vijay Kumar, Nemirovsky Family Dean of Penn Engineering; M. Grace Calhoun, T. Gibbs Kane, Jr. W’69 Director of Athletics and Recreation; and William Burke-White, Richard Perry Professor and Director of Perry World House, Penn’s home for global engagement on campus. At the epicenter of the University’s global engagement efforts is Penn’s relationship with China, which began more than two centuries ago. Today, Penn offers more than 12 study abroad opportunities in the country, and nearly 2,000 undergraduate and graduate students who are Chinese citizens are currently enrolled on campus. Beginning with the first official partnership with Shanghai’s Jiao Tong University in 1980, the University now celebrates more than 20 partnerships with Chinese institutions. The Penn Wharton China Center, located in Beijing and established in 2015, provides support for some of the more than 400 faculty research projects and instructional activities taking place in China. In their conversation with President Gutmann, faculty speakers David Galligan, Winka Dubbeldam, and Karl T. Ulrich shared some of the ways their work is integrally connected to China and the larger world. David Galligan, the Marilyn M. Simpson Endowed Professor in Large Animal Clinical Studies at Penn Vet, spoke about his work to improve the health and productivity of animals in the dairy and agricultural industries while limiting damage to the environment. Galligan’s team has initiated projects in China, India, and The Gambia that help other cultures grasp the concept of animal health as an element of production efficiency. In steering other countries to focus more on increasing their yield and less on the number of animals they raise, Galligan’s work helps to feed populations and promotes worldwide environmental benefits at the same time. Winka Dubbeldam, the Ella Warren Shafer Miller Professor and Chair of Architecture at the Penn Weitzman School of Design and founding partner of the firm Archi-Tectonics in New York, shared her vision for the design proposal that was selected for the 2022 Asian Games in Hangzhou. The plan includes stadiums, a shopping mall, and a park, designed to celebrate local culture and be outstanding examples of energy-efficient green design. The project will be exemplary of the government’s “Sponge City” concept, featuring scenic wetlands for rainwater storage and permeable pavements that prevent excess water runoff. Karl T. Ulrich, Vice Dean of Entrepreneurship and Innovation; CIBC Professor; and Professor of Operations, Information, and Decisions at Wharton, shared his thoughts on Penn’s innovation ecosystem, and the development of Venture Lab, a new undergraduate entrepreneurship hub located in Wharton’s forthcoming Tangen Hall. “The Venture Lab in Tangen Hall will provide unparalleled resources for all Penn students, and has a goal to integrate the various disparate entrepreneurial activities across campus,” Ulrich said. The new building, to be completed in 2020, will house programs run by Wharton, the School of Engineering and Applied Science, and the Penn Weitzman School of Design, in addition to other interdisciplinary opportunities accessible to all students. The Power of Penn Celebration in Hong Kong was just the beginning of a whirlwind week that took President Gutmann and other members of the Penn Community to several other locations across China: The 53rd Wharton Global Forum took place in Shanghai (March 7-9), the Penn Weitzman School of Design held an event on March 7 at the Penn Wharton China Center, and the Penn Football team spent their spring break touring the country prior to participating in the 2019 Penn-China Global Ambassadors Bowl (March 9). But as the evening culminated with a lively reception, the conversation between alumni, parents, friends, faculty, and staff provided a welcome pause and exemplified the strength and warmth of the University’s ties in the region.